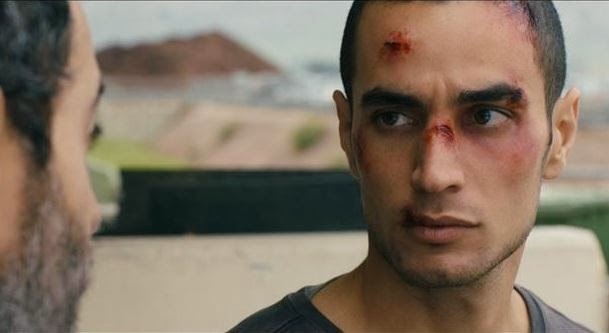 The first scene in “Omar” (Adam Bakri) finds the titular character scaling the mountainous security barrier cutting up various Palestinian towns in the West Bank. What’s most telling, however, is not the monstrosity of the wall itself but the way in which the scene itself is presented. No dramatic music accompanies Omar’s climb and even when a warning shot is fired, his demeanor refuses to noticeably change. And consider how he’s dressed – like a young man sprinting off to the movies. The casualness of the moment is the reveal. He is scaling the wall to go and meet Tarek (Iyad Hoorani) and Amjad (Samer Bisherat). They are his friends but they are also his compatriots, fellow freedom fighters in the eternal holy war that pervades the region. These initial moments, however, are lightly played as they sit around telling jokes and take tea served by Tarek’s younger sister, Nadia (Leem Lubany). Yet, there is also a distinct tension, but a tension born of the romantically intimate rather than the political incendiary. This is a telling difference that tips “Omar’s” hand. Nadia seems to pay extra attention to Omar and the way camera cuts between Omar and Tarek, looking at one another and looking away, smiles caving into uneasiness, clues us into the courtship. Indeed, Omar loves Nadia and yearns to propose. He initially views Tarek as the impediment to romance, but this dynamic becomes more complicated when the three men go in on an operation to kill an Israeli soldier and wind up fugitives. It is Omar who is eventually captured, taken prisoner, tortured, and told by an Israeli agent, Rami (Waleed Zuaiter), to talk, to turn coat and become their informant. Omar has other ideas. Nominated for Best Foreign Language Film at the 2014 Academy Awards, written and directed by Hany Abu-Assad, the structure of “Omar” is very much like a maze – which is to say that just when you suspect its characters may have found their way out, they somehow wind up right back where they began. The script is packed with narrative stops and re-starts, the entire structure smartly underscoring the frustrating cyclical nature of the never-ending Israel-Palestine conflict. As the story tensely progresses and situations and allegiances adjust accordingly, the more conspicuous the absence of any political or religious rhetoric becomes. This past year, for reasons unnecessary to address in this review, I took a few collegiate correspondence courses, one of which was world religions. Much of the matter we focused on was, in fact, Israel and Palestine, and my ginormous course-concluding paper tasked me with not only writing about their conflict but proposing a "solution". I recall reading that and literally laughing out loud. Me?! They wanted me, some stupid American, to offer a solution to the Israel-Palestine conflict?! Of course, to find a solution one must first fathom the problem, and the problem at the core of the conflict is never addressed in "Omar." A particular moment finds Omar and Rami sharing a cigarette and chatting like regular folk. It is so simple. It is so far away.